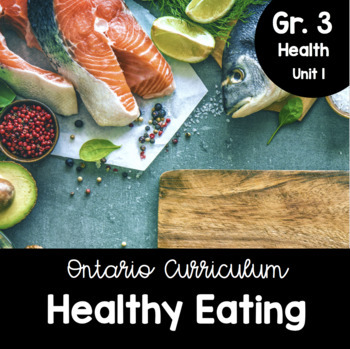 The Grade 3, Unit 1: Healthy Eating packet is designed to meet the specific expectations outlined in the 2018 edition of the Ontario Health and Physical Education curriculum document. Please note that this packet has been updated as of 04/06/19 and reflects the updated Canada's Food Guide. To reflect the updated version of Canada's Food Guide, this packet makes no mention of food groups. Instead, the focus is on establishing healthy eating routines and patterns, and making healthy and informed decisions when it comes to foods. Students are encouraged to include a plant-based diet into their food choices, and little focus is on the dairy aspect of the former food guide. 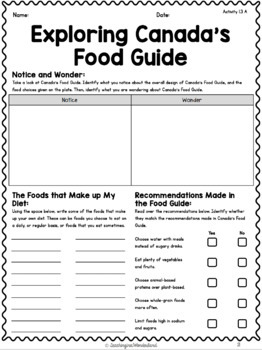 This packet combines the advice from Canada’s Food Guide as well as students’ own knowledge about what healthy eating looks and feels like to develop an understanding of how eating healthy can improve a person’s general health and well-being. 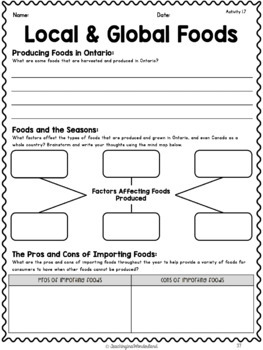 Students explore and use the information provided in the updated version of Canada’s Food Guide to identify how the origins of foods affect its nutritional value as well as its environmental impact. Students also explore how local fresh foods and foods from different cultures can be used to expand their range of healthy eating choices. The final portion of this packet has students explore the importance of good oral health to the overall health of an individual. 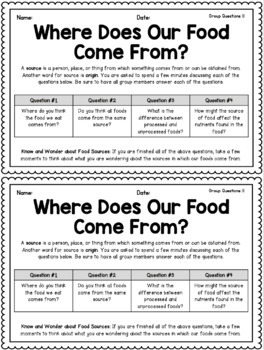 Each lesson includes a full-length, printable lesson plan that has materials that are ready to be used immediately. Each lesson also includes a description of lesson learning goals and success criteria that can be used to judge student success at the end of the lesson. Please note that there are only 4 readings included in this packet. There are writing and minds-on activities that get students thinking about what it means to eat healthy and the importance of making healthy food choices. Each assignment includes response pages, an assignment description, and a rubric to use to grade and gauge student success/performance. Please note that there are no answer keys provided in this packet. Student responses are based on the information they have researched, and any information needed for the responses can be found in readings and on supplemental websites. There is no quiz or test presented in this packet. Students demonstrate their understanding in other ways. Q: Are there any quizzes or tests provided in this packet? A: No, there are no quizzes or tests provided in this packet as the content addressed is such that cannot be "tested" but rather explored by students. Q: Are there many writing activities in this packet? A: There are writing activities in this packet, and no cut and paste activities. The writing required by students is usually 2 - 3 sentences, and each activity can be adapted to where students work with a partner to answer the questions. Q: Are there any demonstrations of oral health in this packet? A: The oral health portion of this packet is not hands on. You can easily adapt it so that it is by demonstrating using a toothbrush and toothpaste how to take care and brush teeth. There are posters and activities included that have students explore how to appropriately brush their teeth. I am here to help! If you have any questions about this unit, or any of my units, please leave me a question under the Q&A tab below. Or, you can email me at teachinginawonderland@gmail.com. Please fill out this Google Form to request a product to be made. Follow me on social media to be the first to know about new product releases, giveaways and contests. This product is allowed to be used in the purchaser's classroom only. If you wish to share this resource with another colleague, or parent, please purchase an additional license at a discounted price. This product is not to be posted online, in whole or in part, without Teaching in a Wonderland's permission. This product is not to be altered in any way and sold as a new product.